Welcome to the class information for Kestrels and Eagles. The curriculum newsletters below show the plans for each term. Summer term topic in Reception is all about Living Things. This half of the term we have learning about plants. 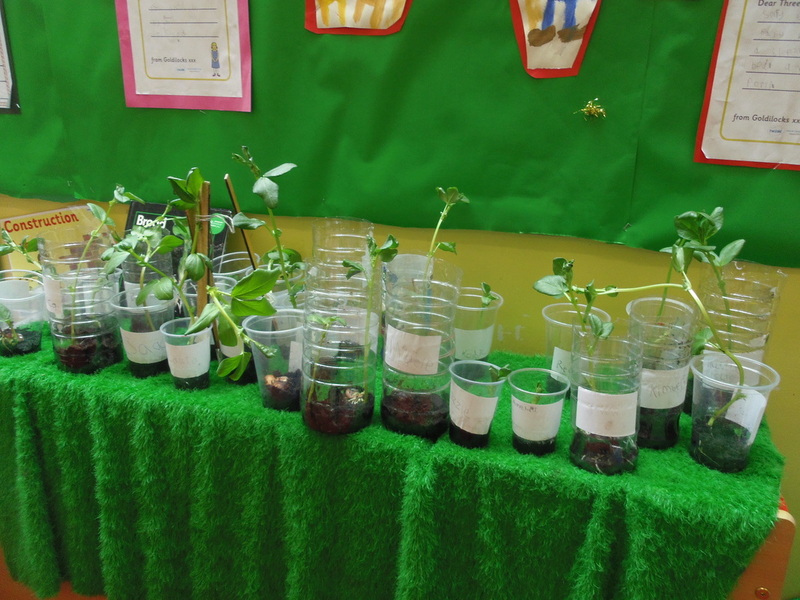 Having read Jack and The Beanstalk at the beginning of term, Reception have been busy planting and caring for their beans. The children have been watching and waiting for them to grow and miraculously they all have. To begin with we watched our beans through clear plastic cups, allowing us to see the root system developing before we transplanted them into soil. Alongside this, we have been writing our own bean diaries. We have read many books – information and fiction – about plants and growth and this has encouraged more discussion and sharing of our own knowledge and experiences. 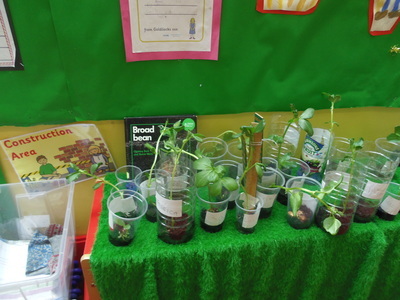 We particularly enjoyed ‘Jaspar’s Beanstalk’ ‘Growing Vegetable soup’ ‘My Bean Diary’ and ‘You’ll Soon Grow Into Them Titch’. This last book has made the link between plants and animals and shows the life cycles of both. ​As we approach the half term, we shall begin to look at animals and their environments, starting with minibeasts. In Reception, continuing our Living Things topic, we have had great success with our bean growing and the children have now ventured home with their bean plants. Perhaps at the end of June or into July there will beans on the menu for tea! In the last week before half term, the children were very keen to explore the garden for minibeasts and this has continued into our first week back. They are experts at finding woodlice, spiders, larvae, worms, slugs, snails, centipedes, beetles, ladybirds and a lizard… actually it was a newt……. but for a short while it was a lizard!! We encourage the children to look closely at the similarities and differences they can observe between the bugs they find – shapes, colours, sizes, number of legs, antennae, how they move, wings or no wings, insects or not insects, life cycle changes etc. and make links with their own knowledge and experience. We also encourage them to think about the patterns they might start to note such as understanding life cycles and how, for example, caterpillars change or metamorphose as do ladybirds and other animals. The children are aware that we need to take care of these little creatures and have provided soil, leaves etc. whilst they keep them in pots for a short while. At the beginning of the week there was an exciting arrival – some teeny, tiny caterpillars from Insect Lore. ​We shall be observing, recording and anticipating their progress over the next few weeks. And of course we HAVE to read The Very Hungry Caterpillar. We look forward to our visit to Farmer Gow’s on Friday 17th June.